Scott Knowles reviews Simon Hood’s book, Bicycle Kicks, for Under The League. In October, the former Newcastle United and Bolton Wanderers defender Robbie Elliott will cycle between each of the teams his former boss Bobby Robson managed – a trip that takes in the likes of Ipswich, Porto, and Barcelona amongst others – in order to raise funds for the chosen charities of the Sir Bobby Robson Foundation. 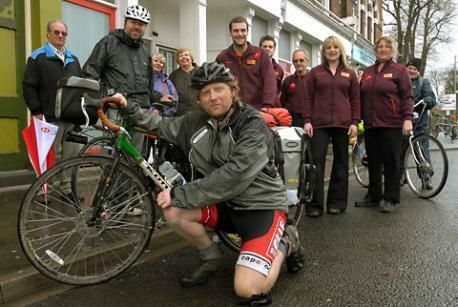 It’s a task that will see him ride over three thousand five hundred miles across four countries despite having confessed that up until recently he hadn’t ridden a bike since he was a child. It’s not the first time someone has taken on a grueling football-related cycling task in the name of a good cause – indeed if Robbie was in need of any tips he could do far worse than turn to Simon Hood, a man who during the 2009/10 season set out to ride between each of York City’s league and FA cup fixtures in a bid to raise as much money as he could for the Alzheimer’s Society. It’s the story of that attempt that makes up Bicycle Kicks, the dual tale of one man taking on both nature and the limits of his bike/body, and one team’s bid to climb free of the notoriously difficult to escape Conference National. A lazy description would be to describe it as the bizarre love child of ‘Fever Pitch’ and the underrated David Lynch film ‘The Straight Story’ due to the road-trip nature of the adventure and the at times surreal characters Hood encountered along the way (an unlicensed campsite bar where the beer is free and pulled under cover of a sheet, or the former rig worker turned poet obsessed with Byron and prone to recite his own poems in full at people whether they like it or not). But it also shares that films theme of the generosity of strangers – of people Simon had never before met but who were willing to put him up for the night, buy him meals, or, in one case, gift him a completely new bike so that he could try to complete his admirable task. The season is split into the months that become the books chapters – with details of the games separated by descriptions of the toil/joy endured getting to each stadium and extra geographical/autobiographical information added for good measure which, along with numerous hearty dollops of humour, helps eradicate any possible threat of the book becoming a tedious cycle of match reports and cross-country endurance bike fetishism. Immediately post London Olympics it became fashionable to drag football through the mud, to heap scorn on it and wonder aloud why the despicable oafs who participate in our national game aren’t more like the angelic athletes who made us so proud this summer. This book is an antidote to that. Within the hundred and fifty five pages on offer you see what football truly means to people – the bonds it forms between families and friends that stretches through generations and holds firm as glue. And as heroic and worthy the task Hood performs you can’t help but feel that football is the true hero – the sport that drives people like Simon and Robbie to do such extraordinary things in the first place. Special mention must go to York City who, almost as if rising to the challenge set by Simon, provide their own extraordinary narrative that adds immensely to the books drama. For anyone with the vaguest interest in football, non-league or otherwise, ‘Bicycle Kicks’ is a must read, and for those whose interest in the sport may have lapsed due to player greed, recent court cases, or bad press in general this book may well just restore your faith. Posted on October 6, 2012, in UTL Archive and tagged Bicycle Kicks, Bike Ride, Book Review, Charity, Simon Hood, York City. Bookmark the permalink. 1 Comment. I’m reading this now, and am loving it. A great read, and a fantastic account of a frankly ridiculous mission!